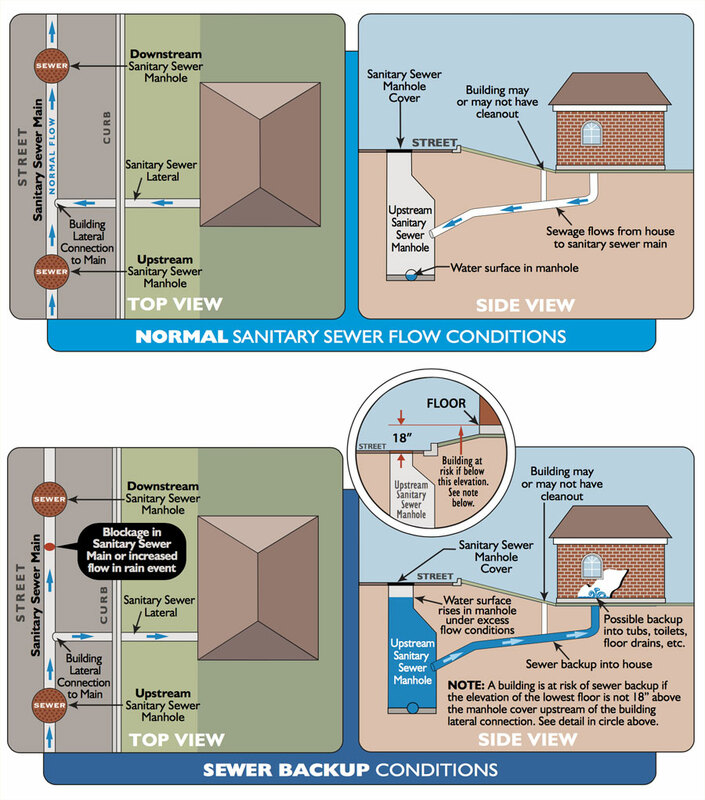 Sewer backup occurs when a sewer line becomes full and “backs up” in the opposite direction of normal flow. If your home or business is not properly protected, raw sewage can move out of the main sewer line and into your home or business, causing significant damage. While backups are rare, it is important to make sure you are protected. Please refer to the diagram below. If your home or business foundation is located at an elevation lower than the nearest upstream manhole (such as on the downside of the street), you are at an increased risk for sewer backup. In this case, the City of Mobile plumbing code requires you to have a sewage backup protection device in place. Contact a licensed plumber to evaluate your sewer line and install the proper device. These may include a sewer popper, a grinder pump or a check-valve with removable inner parts. Each must be installed by a licensed plumber and properly maintained. Unforeseen events that break or block a sewer line (such as construction, geological changes or vandalism.